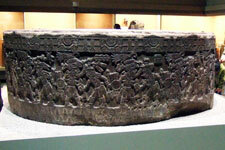 The Stone of Tizoc is one of the most important and impressive of the carved Aztec artefacts. 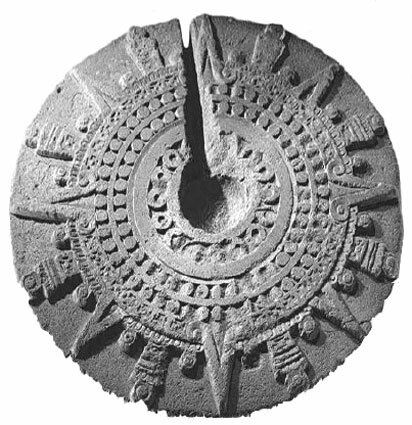 Made from basalt it is approximately 2660 mm in diameter and 880mm high and features on its upper surface an image of the sun and around the sides are relief carvings showing fifteen pairs of warrior figures positioned between decorations depicting the earth and sky (see pic 1). There have been many articles written about the history of the stone and the possible meaning of the pictures and symbols present on the stone but very few of them deal with the actual design and methods used in its construction. The damage to the edges of the stone makes accurate measuring difficult, combined with the stone being in the shape of a cylinder and having such a profusion of images makes it difficult to perceive the design methods and construction lines used. 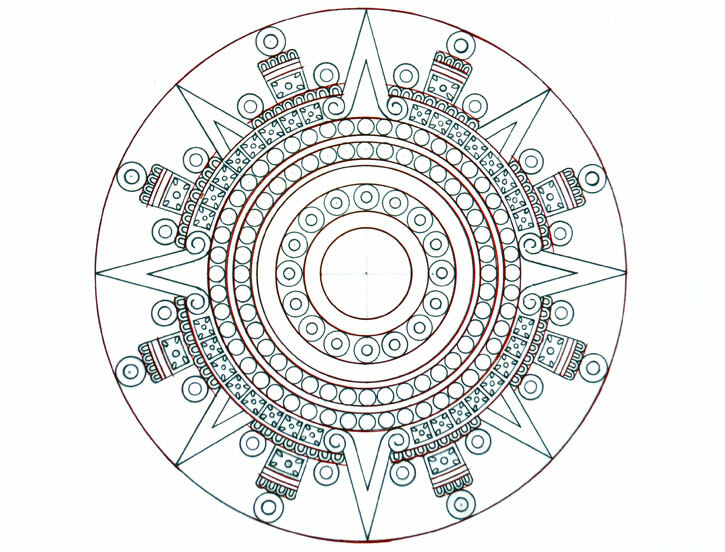 Also modern methods of linear measurements such as feet and inches or metric units do not reveal the true nature of the design and in order to fully understand its construction and to appreciate the mind of the artist responsible it is necessary to apply those Aztec measurements that were used at that time. 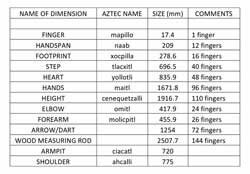 Professor John E. Clark in his book Aztec Dimensions of Holiness quotes many such measurements based on parts of the body. These have been shown in this table (pic 2). 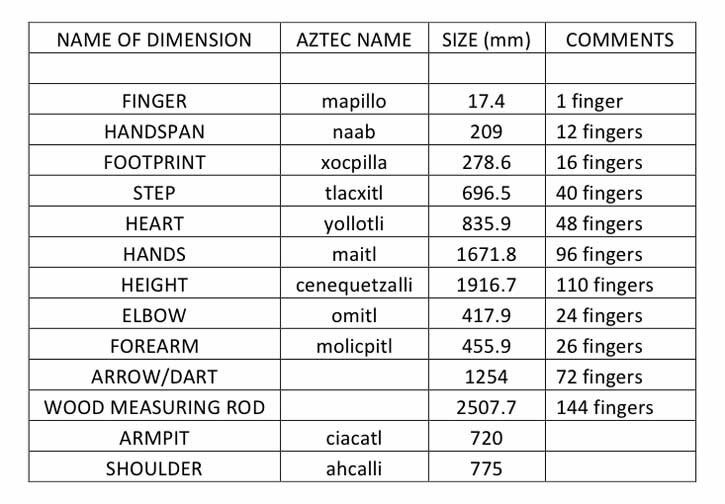 Most of these measurements are multiples of the basic finger length which is equivalent to 17.4mm which when applied to the sizes quoted for the Tizoc stone gives a height of 50.57 fingers (880x17.4) and a diameter of 152.87 fingers (2660x17.4). The circumference of the stone which forms the length of the frieze would then be 152.87xPi = 480.255 fingers. Observations of the various patterns contained in the frieze showed that there were 15 warrior scenes, 20 star motifs, 4 flint knife patterns, and 96 earth symbols (pic 3). 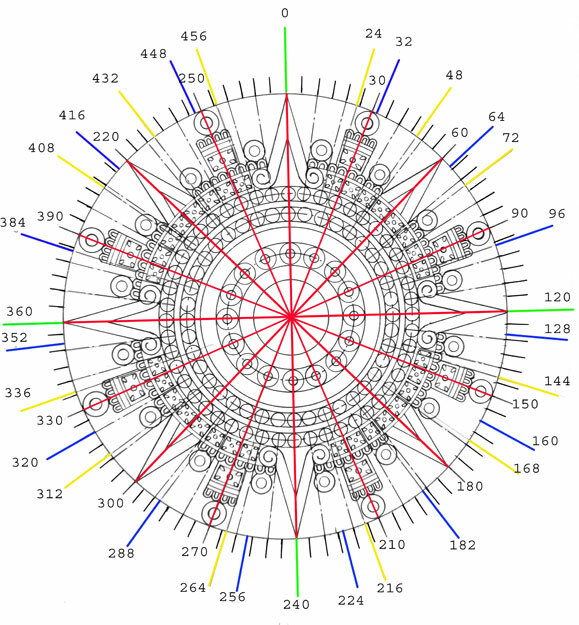 All of these patterns if equally spaced would all fit into a circumference of 480 fingers e.g. 20x24=480, 4x120=480, 15x32=480, 96x5=480. From an Aztec measuring point of view it is also very handy i.e. 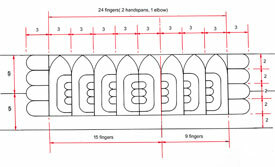 40 hand spans = 480, 30 foot prints = 480, 12 steps = 480, 60 hearts = 480, 5 hands = 480 and 20 elbows = 480. It seemed obvious that all of these patterns were designed to fit on a circumference of exactly 480 fingers which would therefore mean that the diameter of the stone was designed to be 152.8 fingers. (For practical purposes a figure of 153 fingers could also have been used, which would mean the use of a measurement of half a finger length). 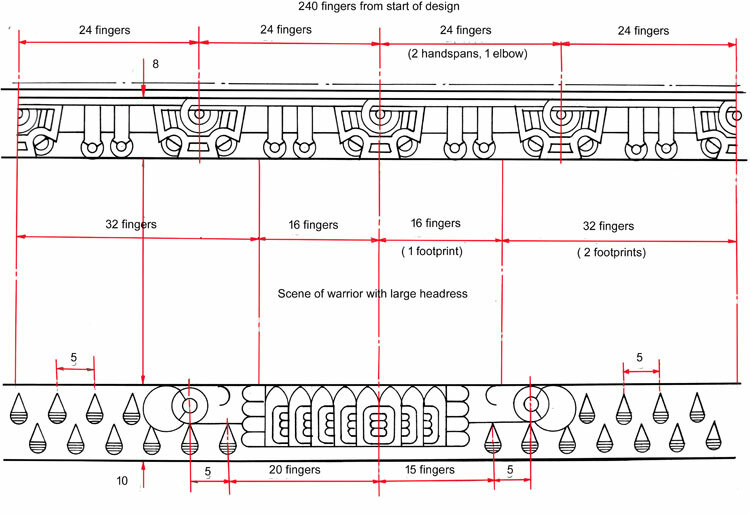 Further analysis of the various patterns indicated that these too were based on the finger length and also contained many other Aztec dimensions. See pix 4,5 and 6. 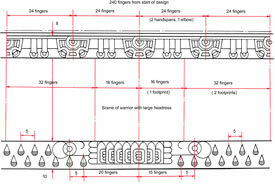 Scaling of the patterns using the known lengths indicated that the upper star design was 8 fingers deep, the warrior scenes 30 fingers deep and the lower earth patterns 10 fingers deep. The stone above the star pattern was badly damaged along the edge and so was difficult to measure; however it was at least I finger deep with another finger for the depth of the relief carving which would give a total design of 50 fingers to the overall height of the stone. 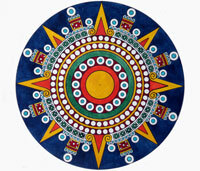 The design on the top is a typical Aztec sun motif (pic 7). 48 circles outer ring pearls. 8x60=480, 16x30=480, 32x15=480, 48x10=480, 96x5=480, and 40x24=480. 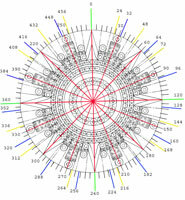 They could therefore be produced by measuring the required number of fingers around the outer circumference for each segment and then drawing a line from each point back to the centre of the circle. It is also possible to produce these segments by constructing various polygons and then further sub-dividing the angles to obtain the required number of parts. I consider that in this case the first method is more likely however use of some or all of the second method would be a good check on the accuracy of the stepped off units. Comparison of the designs of the frieze and the top face shows many similar sub-divisions. All of the various designs (apart from the upper line of earth symbols) have a common start point and many of them touch at the same points around the circumference (pic 8). 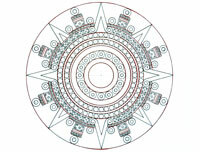 The top face also comprises many concentric circles within the design (pic 9). As stated previously the diameter of the stone with a circumference of 480 fingers would be 152.8 fingers. In addition I had found a reference stating that the inner bowl was 450mm diameter or 26 fingers. 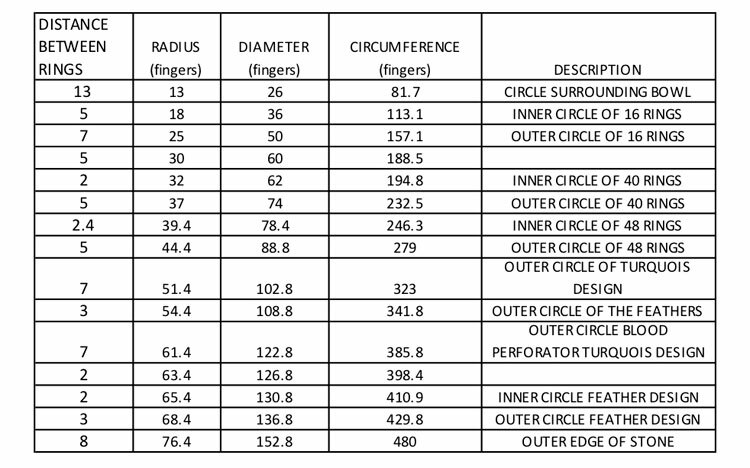 Using these two figures and scaling off a plan view of the stone it was possible to estimate the distances between each circle and therefore the radius and diameter of each and them. Due to the poor accuracy of the reference photographs and drawings I rounded off the estimated distances to the nearest whole number - the results are shown in this table (pic 10). As can be seen the total for the diameter is less than the estimated figure of 152.8 fingers and at first I assumed that the difference was made up on the outer edges of the design. The other thing to notice was that none of the circumferences could be sub-divided to give equal spacing for any of the patterns. Also I was curious to know how the artist had decided the position of the two rings of pearls and how he knew that the number of circles would fit into the space allocated. On further investigations I decided that the diameter was not made up at the edge of the stone but had to be located elsewhere in the design. I noticed that the band separating the two circles of pearls looked slightly wider than 2 fingers and so I looked into the possibility that this was in fact 2.4 fingers wide. 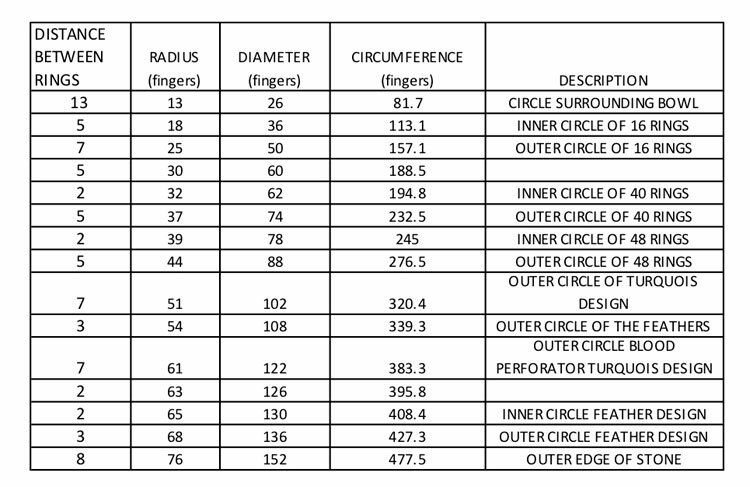 I therefore revised the concentric circle table as follows (pic 11). If in fact this was the case then the radius through the center of this band would be 38.2 fingers which is exactly half the radius of the stone and would give a circumference of 240 fingers. 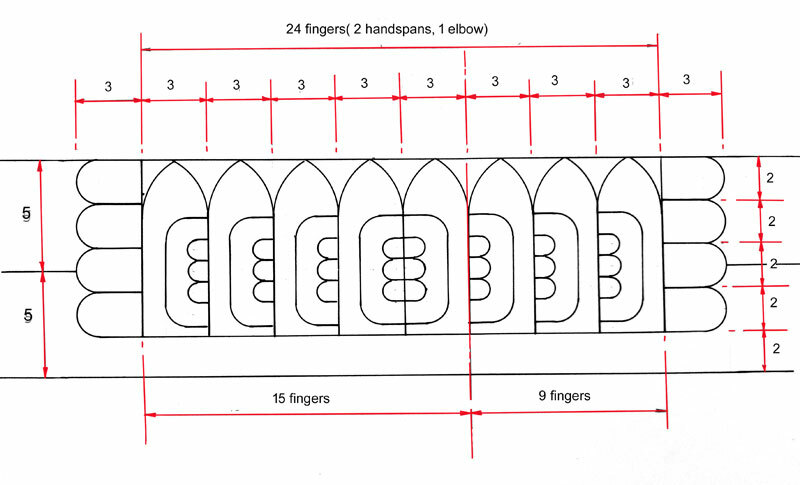 This could then be used to set off the two sets of pearls as 240/40 = 6 spaces each and 240/48 = 5 spaces each. Another interesting observation on the distances between circles shows that they are mirrored about the central band e.g. 13, 12, 12, 2.4, 12, 12, 13. 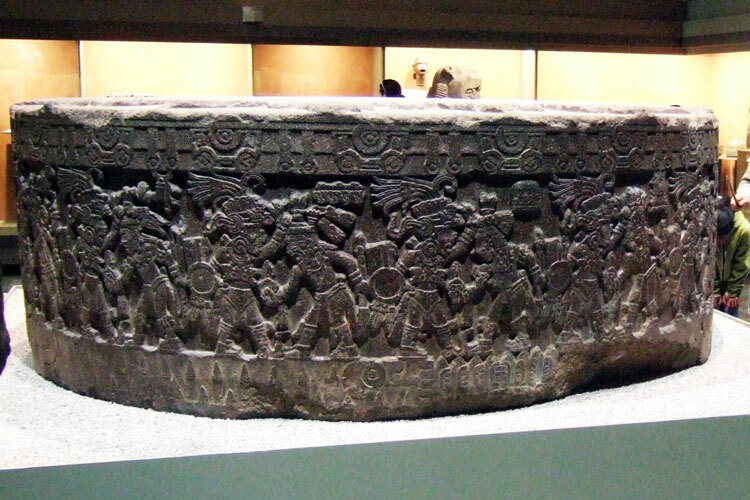 The design of the Stone of Tizoc has proven to be both fascinating and surprisingly detailed. The designer has managed to successfully combine many different images and patterns within one impressive piece of art. The obvious depiction of the various victories of Tizoc has been incorporated magnificently into a complex combination of equally spaced symbols both angularly and linearly. I can only wonder if the alignment of the various patterns within the design has some other deeper meaning. 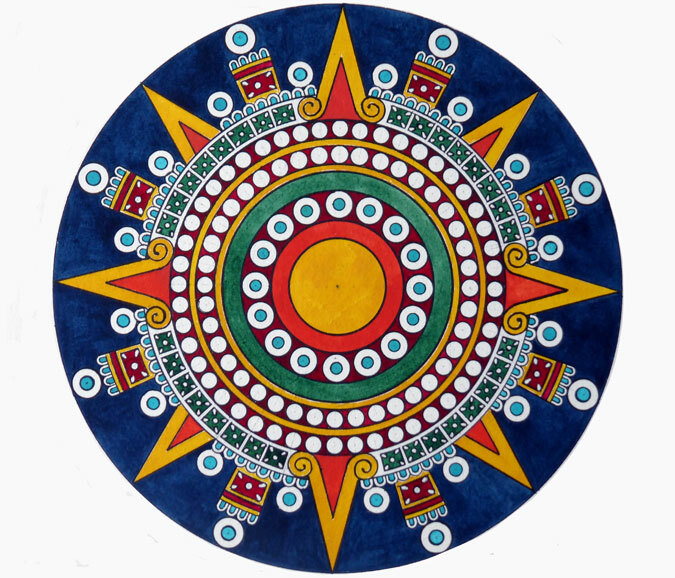 The use of Aztec dimensions has helped to see meaning in the structure of the design and has given some insight into the artist’s knowledge of mathematics. • George Grant MacCurdy titled Aztec calendar Stone in Yale University. • For the side of the Stone I used as reference an expanded drawing from Manuel Orozco y Berra’s 1877 El cuauhxicalli de Tizoc. • Aztec dimensions of holiness by John E. Clark. Photo of original Tizoc Stone by Ian Mursell/Mexicolore.